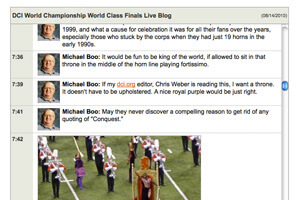 As the entire drum corps community looks ahead to the new year and the summer of 2010, this week, Drum Corps International recaps some of the highlights of 2011, today with the most read DCI.org headlines from the past summer. 1. 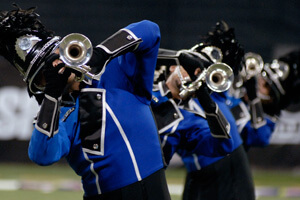 Blue Devils mirror '09 Concord, Calif. corps makes undefeated run to second straight title Sunday, Aug. 15, 2010: The 2010 World Championship Finals ended with the color gold for Blue. For the second year in a row, the Blue Devils (1st, 98.90) won the gold medal in the World Class, concluding one of the most competitive Drum Corps International seasons in recent history. "I'm not sure how we got there, but I know what made up the organization," said Blue Devils Executive Director David Gibbs. "It's the staff, designers, instructors, and an amazing group of kids who were committed from day one to the end. The talent and commitment of these kids made it happen." The Blue Devils' winning program, "Through a Glass, Darkly" was based on the experimental musical selections of Bob Graettinger's "City of Glass" that was written for Stan Kenton. "We knew it probably wouldn't be the crowd favorite," said Percussion Arranger Scott Johnson. "I don't want to say we didn't care about the crowd, because we always do, but we wanted to try something different. We figured after last year's success we had to do something different, and the performers bought into it." Read this article in its entirety. 2. New and re-emerging corps approved for the 2010 DCI Tour Friday, May 21, 2010: The Open Class Advisory Committee met during the first week of May for a final evaluation and review of new and re-emerging drum corps throughout the country. 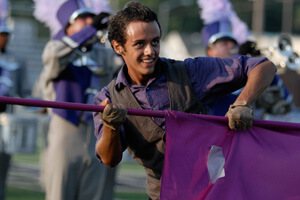 Following the evaluation, six Open Class corps have been approved for participation in the 2010 Drum Corps International Tour. "For DCI's Open Class, growth is not optional, it's an integral part of our mission," said Open Class Coordinator David Eddleman. "The Open Class exists to provide life changing experiences for our youth participants by encouraging, developing and supporting existing corps, new or re-emerging corps, and those corps whose goal is to compete in DCI's World Class. As a result, we are pleased that six drum corps will be added to this summer's contest schedule." New and re-emerging corps wishing to participate in the Drum Corps International Tour annually undergo an evaluation process, which is supervised by the Open Class Advisory Committee (made up of seven Open Class corps directors) and key members of the DCI staff who monitor progress and offer assistance. Read this article in its entirety. 3. 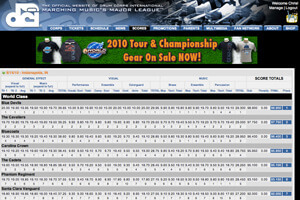 Recap Analysis: 2010 World Class Finals An in depth look at the judges' score sheets from the '10 World Championship Finals Sunday, Aug. 15, 2010: At the end, it was as it was in the beginning; Blue Devils in 1st place, completing another undefeated season, the second in a row and almost the third season in a row, save for 0. 250 at the DCI Eastern Classic and 0.025 at Finals in 2008. The Cavaliers maintained their late season surge over three corps that had beaten them earlier and Bluecoats won their first-ever top-three medal at the World Championships. Carolina Crown and The Cadets couldn't sustain early season successes over The Cavaliers and Phantom Regiment popped back into the top-six. Blue Stars placed 8th for the third year in a row and Boston Crusaders held off the surging Madison Scouts. Blue Knights slipped under Scouts and Glassmen finished in 12th. There were no dramatic changes in placements, with all finalist corps placing the same in Quarterfinals, Semifinals and Finals. Five corps moved up in score from the Semifinals and seven moved down. Read this article in its entirety. 4. Live Blog: World Class World Championship Finals Saturday, Aug. 14, 2010: Drum Corps International staff writer Michael Boo reported on all of the action from Lucas Oil Stadium, providing live commentary as each corps performed during the World Class World Championship Finals. From the first corps' step-off to the final notes of the World Champion Blue Devils' encore performance, Boo provided his expert insights and a look at what was going on in and around the stadium throughout the evening. Read this article in its entirety. 5. 17 remain after some shakeups and surprises Friday, Aug. 13, 2010: All 23 World Class corps took the field head-to-head for one last time Thursday, Aug. 12, as the Blue Devils mirrored their previous first place standing, raising their score to 97.90 at Indianapolis' Lucas Oil Stadium for the World Championship Quarterfinals. "They did a tag at the end of the show which was bringing us back to the mirrors – it was an exclamation point on the show," said Blue Devils Program Coordinator and Color Guard Designer Scott Chandler while explaining a new addition to the corps' production. "'Through a glass darkly' is a very famous quote. It's about getting clarity. So the whole show is about going back and forth to the mirrors, trying to find clarity, always trying to see clearly. To find what you're searching for, whether that's yourself, or a new way of doing drum corps, or a new way of hearing music." But while the first position remains the same, other battles are taking place for 2nd, 7th, and 13th places, including an upset by the Cavaliers (2nd, 96.55). After being .4 behind one week earlier in Allentown, the corps worked to edge the Bluecoats (3rd, 96.25) by a mere three-tenths of a point Thursday night. Read this article in its entirety.